I wish you all a very Happy Chinese New Year! On Chinese calendar this year is the year of the Snake. Chinese people believe a snake is a little dragon because the prototype of the dragon is the snake. In Chinese culture the snake symbolizes longevity, productivity and prosperity. I wish all of you good health, successful careers and best luck in the year of the Snake. Today is the very first day of the first lunar month. It is when the old year ends and the new one starts. · It is a time for family reunion. · It is a time to replace the old with the new. · It is a time to wish for bumper harvest. · It is a time to pray for good fortune and happiness. The most common custom of Spring Festival is to give new year blessings. People wish each other the very best. So I want to give you my new year blessings: I wish you all a prosperous and happy new year! Today is also one of the happiest days of the year in London. Over the past 12 years, at this time, from China Town to Charing Cross, from Leicester Square to Trafalgar Square, streets have been lit with lanterns and fireworks. Hundreds of thousands of people have joined in the revels. This has created the biggest Chinese New Year celebration outside of Asia. 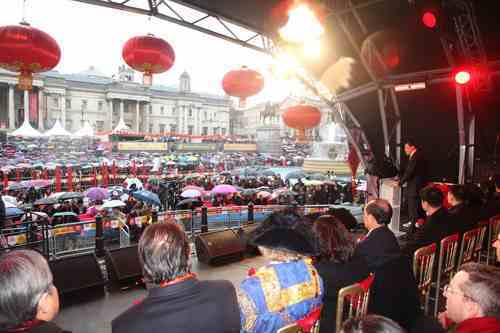 As we all gather to celebrate in London, Spring Festival has become more than a Chinese festival. It is now a carnival for both Chinese and British people. This celebration has become a main attraction of Chinatown, of Greater London and of Britain. 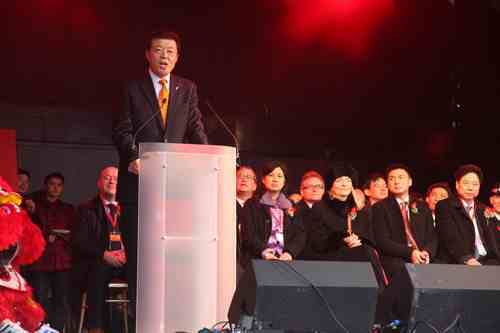 It is a success story of China-UK cultural exchanges. I want to thank artists from the Chinese Culture Ensemble and Happy Spring Festival Ensemble. They have traveled a long way to bring us amazing performances of original Chinese flavour. I also thank Greater London Authority, Westminster City Council and London Chinatown Chinese Association. I thank you for your hard work in the past 12 years. I thank you for your important contribution to closer cultural relations between China and UK and stronger friendship between Chinese and British people. In conclusion I wish all of you a wonderful time at Trafalgar Square.